By Simon Dumenco . Published on June 07, 2018. Time's June 18, 2018 cover. 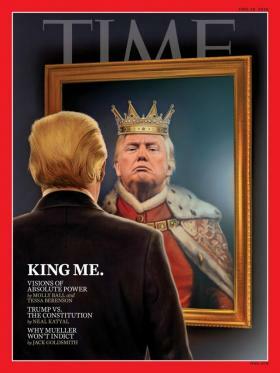 King Trump—aka The Artist Formerly Known as President Trump—makes the cover of the new Time magazine, on newsstands tomorrow. Which is possibly a problem, because Donald Trump maybe didn't intend to name himself king quite yet; he's got to fire Jeff Sessions and John Kelly first. And Congress. And the Supreme Court. And Samantha Bee. That said, the cover date of this issue is June 18, which gives President Trump a little bit of runway, so maybe if he puts his mind to it he can make that deadline? In a 20-page memo sent to [Special Counsel Robert] Mueller in January ... Trump's lawyers articulated an almost boundless view of Executive authority, arguing that he cannot be compelled to testify and cannot have obstructed justice because he has control over all federal investigations. Trump himself claimed in a June 4 tweet he had an "absolute right" to pardon himself, an idea in conflict with the centuries-old principle of British and American law that no one can be a judge in his own case. Trump's critics hear in these ever-expanding claims of presidential authority not just an echo of Richard Nixon, but the kind of unchecked power Americans have bridled against from the moment they broke with the British monarchy in the 18th century. Spurred by his desire to discredit the Mueller investigation, Trump is putting America's founding principles on trial, from its independent justice system to the separation of powers to the rule of law. Read the full piece here (while you're still allowed to).